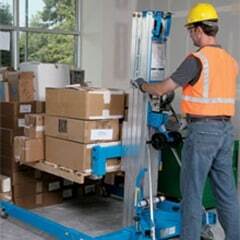 We can supply you with the right Genie Lift for your next project. Hire quality genie lifts from just £104.50 per week. Whether you are working on site installing air con, or in a warehouse lifting materials, SLA hire is a proven solution for safe lifting. Many have tried the national hire companies for this equipment and been disappointed with the quality of the stock and reliability of delivery. We work hard here to provide our customers with stock that is serviced and ready for work on site. We guarantee our delivery dates. Call 0844 774 9467. 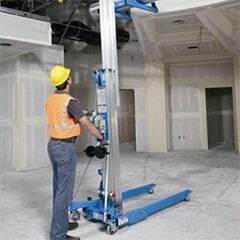 A genie Lift is a form of powered access used to quickly elevate a working platform to the correct height. Ideal for situations where you need a worker and his tools to be able to reach tricky work areas relatively quickly. Powered access has long been the equipment of choice on site. Reliable, robust and dependable the Genie SLA gives contractors confidence when lifting heavy loads at height. Call us on 0844 744 9467 and we will get your gear on site for only £104.50 plus delivery no matter where you are working in the UK and whichever model you need. You can trust in our hire trained staff to get you the best advice and the right model for your project. We have included a spec sheet here. Select the lift you need for your project and give us a call; we will get a LOLER certificated lift to you anywhere in the UK tomorrow. Get access to all the major models; in stock and available for fast next day delivery. You will get a high spec hire, LOLER certificated and with guaranteed delivery tomorrow nationwide. We also supply other access equipment such as scaffold tower, scissor lifts, podium steps and many other general hire items. 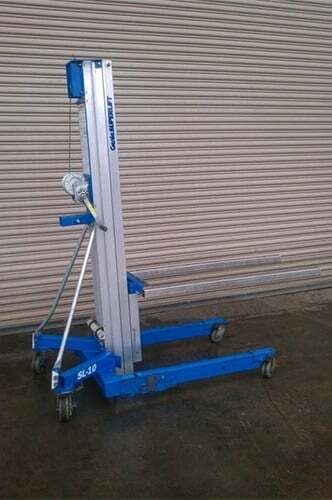 We hire all genie lifts for just £104.50 Per week. Our prices are among the most competitive in the country. Call us today on 08447749467 and speak to our team of hire professionals who can help you select the right product.